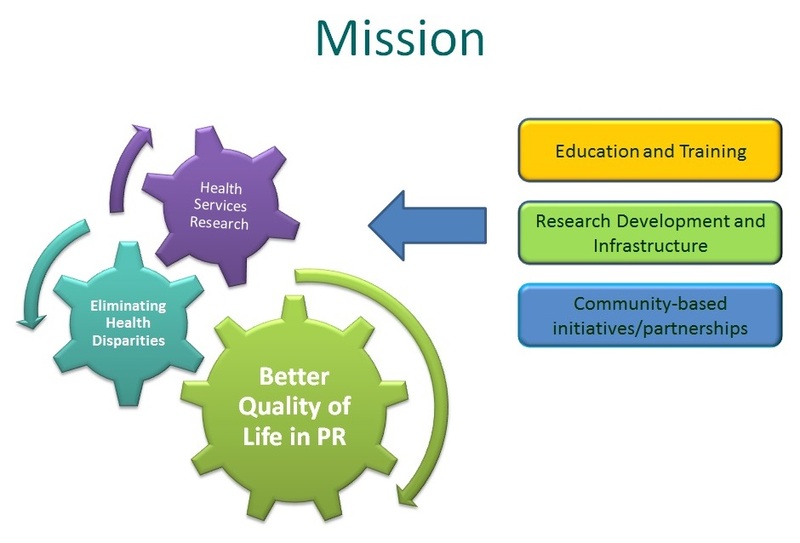 The EHSRC mission is to improve the health and quality of life of individuals, families, and communities in Puerto Rico through the development of new knowledge about health diseases and health care disparities. Our main goal is to enhance research initiatives related to health care disparities and quality of life that impact the Puerto Rican community. We aimed to integrate the expertise from the fields of medicine, public health, and social sciences to evaluate issues pertaining to the delivery and quality of health care in Puerto Rico, the impact of changes in health care systems and models, and the development and dissemination of best practices best on outcomes. Generate new knowledge about health conditions that disproportionately affect Hispanics, and about health services disparities suffered by this population, both in Puerto Rico and in the United States. Strengthen the University of Puerto Rico-School of Medicine’s (UPR-SoM) research infrastructure conducive to excellence in research and training in the area of health services research, with emphasis in health disparities. Enhance the capacity of the UPR-SoM’s faculty to conduct research on improving the health status and delivery of health services to Hispanic populations. Integrate expertise from medicine, public health, and social sciences through collaborative research and alliance. Spearhead the Endowed Health Services Research Center’s (EHSRC) research agenda by establishing strategic collaborative alliances. Provide research training opportunities in health services research to our medical, graduate and postdoctoral students in competitive programs and projects sponsored by the EHSRC. To constitute a highly qualified core staff to direct and provide support to all research activities within the EHSRC. To provide the necessary infrastructure, including adequate space, equipment, and the information technology necessary to conduct high-quality and competitive health services research.